I recently bought seven old comic books at New York Comic Con. Usually when I return home from a little spree, I immediately file new comics on my well-stocked shelves. I’ve done this since I started collecting again in the ’80s. As such, I have hundreds (or maybe thousands) of comics I’ve never read. Not a concern. My attitude was always: “I’m building a library. So if, on a cold winter’s night, I feel like reading a mid-’60s ‘Thor,’ I simply go to my library and pluck one out.” I still believe this system has merit. But I’m closing in on 60, and wrestling with the fact that I’m not going to be able to read every comic book I own. So I resolved to read these seven books I bought at NYCC before filing them away. What did I learn from this exercise? For one thing, I think I now have all the “Gene Autrys” and “Lassies” I need. (I stopped buying Disney comics a long time ago.) Following are my impressions of the first three books. Read about the other four HERE. Stories: In “Gene Autry and the Border Rustlers,” our hero learns that cattle from ranches in Mexico is being smuggled across the border. (Where’s the Trump wall when you need it?) At the Bar-N Ranch, Gene finds that the wheelchair-bound owner does not approve of the activities of his secretive hired hands. In “Gene Autry and the Paper Bag Bandits,” a pair of thieves has a novel gimmick: One of them is a midget posing as a child. And his partner, posing as a musician, carries him around in a bass fiddle case. In “Santa Clara Silver and Lead” (a non-Autry story), ol’ Panhandle Pete recounts the legend of a Utah strike that brought frustration to anyone who tried to profit from it. Talent: Unspecified. The solid art is typical of mid ’50s westerns. Advertisements: Whitman children’s books (“Lucille Ball-Desi Arnaz Cutout Dolls,” “Howdy Doody’s Clarabell Coloring Book,” “The Lone Ranger Sticker Fun”); Wheaties’ boxtop offer for 1954 license plates “from all 48 states”; Schwinn Phantom bicycle. My thoughts: The stories are reminiscent of Gene Autry westerns of the ’40s and ’50s. They are competently written, if not particularly exciting or innovative. Put it this way: They get the job done. The Autry character is not a precise likeness of the movie cowboy. 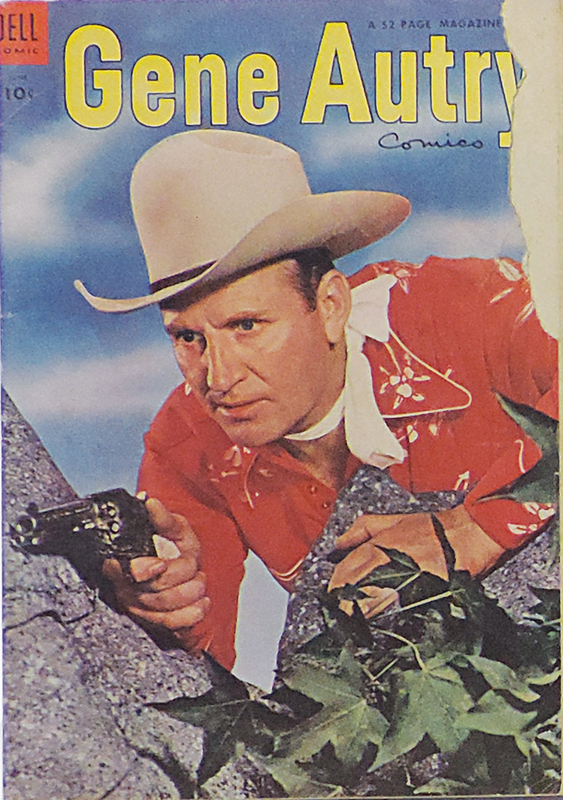 Still, Gene Autry Comics #88 is a neat-o time capsule of 1954. Stories: In “Thundering Hoofs,” Timmy, his parents and Lassie attend the County Cup Race. Young jockey Terry Wallington misses a jump while riding his beloved horse Chieftain. Terry’s wealthy, powerful father calls Chieftain a lazy “hayburner,” and orders the horse be destroyed. In “Blaze” (a non-Lassie story), a wild horse assists a black bear cub, angering the cub’s mama. In “The Challenge,” Timmy gets into dangerous situations trying to impress Spud, a bratty older boy who is new to the area. Advertisements: Daisy Air Rifles (two pages with none-too-subtle strategies on how to let Dad know which Daisy gun you want for your birthday); Juicy Fruit Gum (touting bicycle safety); KE Puzzle Game. My thoughts: If you’re not a nostalgic person (which I am), you’ll have a tough time getting through these stories, which are safe and sanitized in that weird, don’t-rock-the-boat 1950s way. 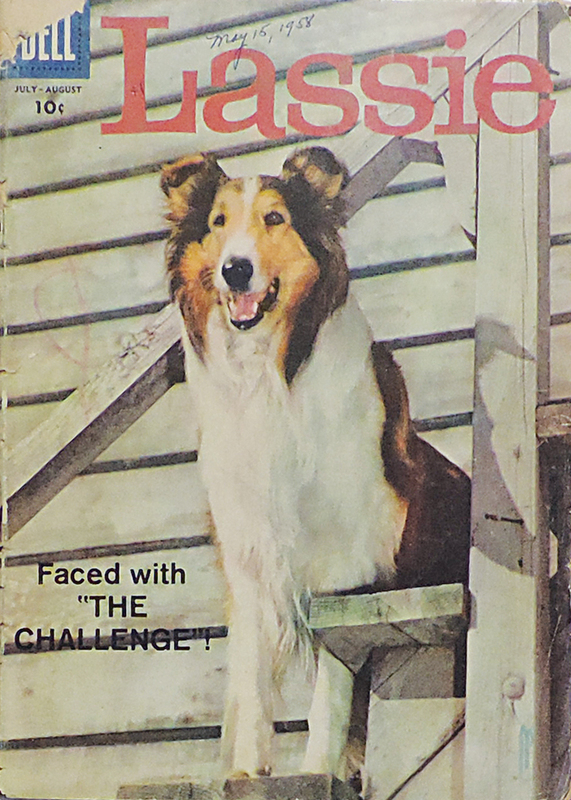 But ya gotta love Lassie, who thinks like a human and always saves the day. Stories: In “Prisoner of the Durado Gang!,” Kid Colt happens to be making a deposit as the gang holds up the bank. 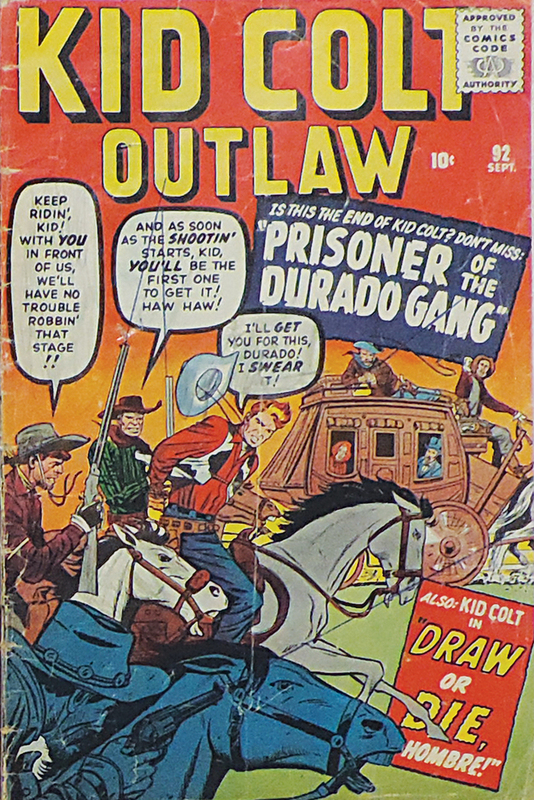 When the Durados force Kid Colt to ride away with them, the law assumes the Kid has joined the gang. In “Draw or Die, Mister!,” Kid Colt happens to be having a drink at a saloon when Slash Slade barges in, challenging any and all comers to a shootout. The Kid stays out of it, until Slash zeroes in on a portly gentleman who earlier testified against him at a trial. In “My Gun For Hire” (a non-Kid Colt story), a freelance gunman makes a bad career choice: Rather than accept a position with a kindly, honest rancher, he takes up with a land-grabbing thug. In “Guns Roar On the Last Train From Yuma!,” the Kid foils a train robbery which, of course, he is blamed for. Also: His trusty horse Steel proves to be not only smart, but possessed of uncanny timing. Talent: Jack Kirby, cover; Stan Lee, writer; Jack Keller, artist (on all Kid Colt stories). “My Gun for Hire” is unspecified, but I know artist Ross Andru when I see him. My thoughts: Here is a book on the cusp; everything about this 10-cent edition screams Marvel, but it was published one year before Fantastic Four #1. Kirby’s cover is a masterwork. Keller’s art is detailed and dynamic. Plot wise, Lee is regurgitating the westerns he watched as a child. But making Kid Colt an antihero — the Kid once killed someone in self defense, and fled rather than face the law — adds drama. Lee gave similarly tortured backstories to the superheroes he invented over the next fertile decade. Andru’s art, likely inked by longtime partner Mike Esposito, is superb as always.